Our Laser marking gives an Excellent quality finish and has our Lifetime Guarantee not to fade or wear off. Size - Large: 51 mm wide x 30 mm high - suitable for medium/large sized Dogs. Fits flat collars up to 25 mm wide. 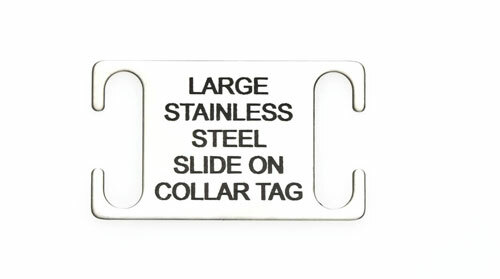 Our design of our stainless steel slide on collar tag will fit all types of dog collar, snap fastening and also buckle fastening. A maximum of 5 lines per side can be engraved with up to 16 characters per line (including spaces).